When San Francisco’s HIV/AIDS historical narrative is compiled, the final week of November 2001 will be remembered as one of its crucial junctures. The week’s concentrated fallout from two decades of local HIV prevention policies roared in with ominous high winds: First, Dr. Tom Coates, director of UCSF’s Center for Aids Prevention, startled the gay community with the blunt suggestion that prevention programs possibly should be discarded since HIV infection rates are increasing. Two days later ACT UP activists Michael Petrelis and David Pasquarelli were arrested for stalking and making terrorist threats against reporters and city health officials who earlier in the month had revealed the rise in syphilis rates in the city. The duo’s long-standing abrasive tactics and contention that AIDS is not caused by HIV has scant appeal among most gays, but their criticism of a self-perpetuating and increasingly irrelevant AIDS industry is in keeping with Coates’ own “AIDS Inc.” characterization of the myriad of ineffective prevention programs. The Bay Area Reporter editorialized that a community debate on the future of HIV prevention was indeed needed to determine the efficacy and appropriateness of various programs and how funding should be allocated. But it also pointedly evoked the specter of a Fifth Column within the community, detailing the recent efforts of Petrelis and Pasquarelli to persuade anti-gay members of Congress to initiate investigations of federally funded HIV-prevention programs. In the Examiner’s December 5 issue, ACT UP ran a full-page public statement ad from Petrelis and Pasquarelli. Apparently it is the first in a planned series of position papers. The pair denied the charges lodged against them, calling them a distortion fomented and coordinated by “powerful AIDS and media industries.” They accused this alleged cabal of attempting to “exploit the World Trade Center calamity” in order to create a perception of dissident AIDS activists as terrorists. Reports of surging syphilis rates, they asserted, are false, and the ad concluded with a plea to the public to resist any future legislative efforts to quarantine gay men with AIDS. Hey, got a network for us? For the past year that has been KRON’s plea since being sundered from NBC. And while there’s speculation that its former patron will bring it back into the flock at some point, KRON would be well advised to reaffiliate with a more contiguous neighbor. Just across Van Ness, in the Tenderloin, the station no longer has many friends. This month’s Street Sheet royally shreds KRON’s four-part October series on homelessness as a welter of misrepresentation and scapegoating. Written in a quasi–“open letter” format with 20 homeless organizations as signatories, the letter requests an apology to the homeless community and a retraction of the series’ inaccuracies. More than just a hint of possible litigation is conveyed. One segment highlight is illustrative: KRON speculated that a yearly income of $70,000 could be made panhandling. This figure came about from one man’s statement that he made $200 on one particular day. Yes, you guessed it: KRON sat right down and multiplied by 365. One can only wonder if Pete Wilson helped with the tabulation, or if he had already gone elsewhere to explain the world to the world. Litigation could also be in the offing if the city’s parking garages fail to provide bicycle racks. More than 30 months after the law went into effect, a recent survey shows 70 percent of garages are not yet in compliance, reports Tube Times, the newsletter of the San Francisco Bicycle Coalition. The Department of Parking and Traffic plans to meet with garage owners to advise them on the best ways to comply with the law. A refusal to implement DPT advice allows the Bicycle Coalition to file a complaint of noncompliance with the Planning Department. If the situation is not remedied there, the City Attorney initiates a lawsuit. SFBC estimates that full compliance with the law could solve most of the employee parking problems in downtown San Francisco. The city’s bike info hotline is 585-BIKE. It would be difficult to find a more united urban community than Bernal Heights. And proven, abiding institutions — the sort you find in neighborhoods that fight to preserve spatial sanity and eschew chain-store colonialism — are the fulcrum for such communities. 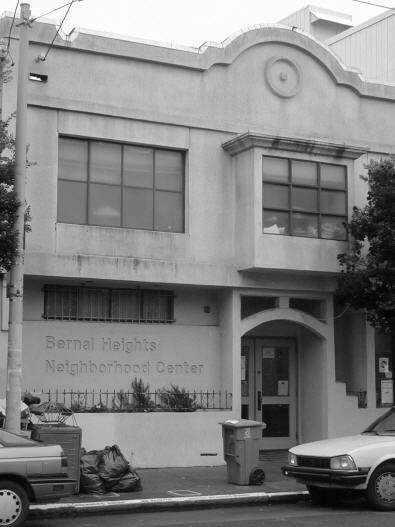 In Bernal, the Bernal Heights Neighborhood Center has fulfilled that role for decades. In 2001 BHNC received more than $48,000 from its 677 members and supporters, the Center discloses in a statement in the current New Bernal Journal. That sum is up 13 percent from 2000. The Center brags that it affects the lives of everyone on the hill. More important, reciprocated community support over the years has made believers of foundations, as well as government and corporate funders. Solidarity — a word many in Bernal use with its original connotations, and without flinching — is money in the bank. The latest example of this dynamic is the acquisition of HUD funding by co-developers BHNC and Mission Housing Development Corporation (MHDC) to construct 37 apartments in the Crocker Amazon for seniors over 62 with incomes less than 50 percent of the San Francisco median. HUD will also subsidize the building’s operating expenses. Seniors will pay only 30 percent of their actual income for rent. The residents will live independently, but BHNC and MHDC will provide supportive services for them as they age. Just another year on the hill, it could be said. The Independent Press Association emails an announcement of El Andar Prize for Literary Excellence, for works that depict Latino life and experience. The deadline for applications is December 31, 2001. For more information, call Julie Reynolds at 831.457.8353 or email her at Julie@elandar.com. Full guidelines appear online at www.elandar.com. Doug Loranger offers a reminder that the supes’ Housing, Transportation, and Land Use Committee will meet on December 13 to discuss board president Tom Ammiano’s proposed six-month moratorium on wireless antennas. Ammiano’s office has been working with representatives of the industry, city attorney’s office, Planning Department, and public to revise the city’s current antenna-siting guidelines.